While working on designs for a new high-speed aircraft, a group of software engineers at NASA’s Langley Research Center developed a program that helps create lighter weight vehicles, while still maintaining strength and structural integrity. Part of the National Aerospace Plane project, the software was necessary to allow designers to easily experiment with new materials and structures, trying a variety of different options for building what would have been the world’s fastest aircraft, the X-30—capable of taking off from an airport in Washington, DC, accelerating to over 20 times the speed of sound, and landing in Tokyo in under 2 hours. In an aircraft like the X-30, what President Ronald Reagan said could potentially be the next “Orient Express,” the benefits realized by weight reduction become critical, while the demands placed on the vehicle’s structure are greatly magnified. Weight reduction translates directly into fuel savings, increased payload, and greater flight range, but that kind of speed places an incredible strain on an aircraft. Named “ST-SIZE” and developed over the course of several years from 1988 to 1995, the software NASA developed for solving this issue allowed for weight reduction through optimizing use of composite materials—helping designers quickly and easily experiment with the full range of effects that individual parts composed of varied and nontraditional materials would have on the vehicle. While the Agency had long been known for bringing its cutting-edge technologies to the public sector in the forms of commercial spinoffs, it was not until 1996 that NASA had ever licensed software to a private company. In that year, the National Aerospace Plane project came to an end, unrealized, but with many technologies ready to be applied to new missions and additional aerospace research. It was then that Langley’s Craig Collier licensed the ST-SIZE software he had helped develop for the X-30 and struck out on his own to bring the software to the broader market. The company he formed, Collier Research Corporation, of Hampton, Virginia, wrote a more capable and robust code based on the ST-SIZE software and now markets it under the name HyperSizer. It has been used in everything from designing next-generation cargo containers, to airframes, rocket engines, ship hulls, and train bodies. Most recently, it was adopted by Bombardier Inc. for design and analysis of the new all-composite Learjet 85. With over 300 companies, projects, and divisions using the software and sales topping $4 million a year, the small software startup has been expanding rapidly in recent years. 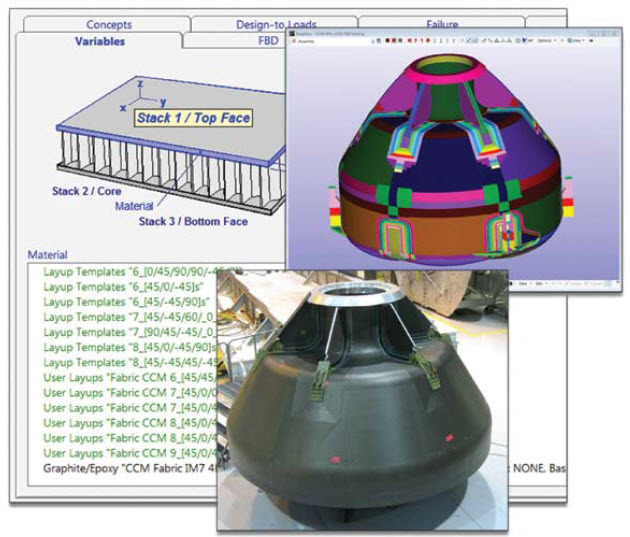 Small Business Innovation Research (SBIR) contracts to apply HyperSizer to nearly all aspects of the new Orion crew exploration vehicle design. The company is now also fundamentally involved in the development of both the Ares I and Ares V launch vehicles. The company has added features to the program, making it more user-friendly and adaptable to different projects. Now, aerospace industry designers and airframe stress analysts use HyperSizer for examining the structural integrity of new designs using both traditional metallic materials, such as aluminum and steel, and more advanced materials, such as composite laminates. HyperSizer software is not another computer-aided design or finite element analysis (FEA) program. It is an integration of aerospace structural design best practices with modern structural vehicle analysis software. The program integrates with the user’s current design software, allowing analyses of new configurations for weight, potential buckling of panels, crippling of posts, the durability of joints, and overall composite strength, including damage tolerance and temperature variables. Rather than being a new program, it is a complementary analysis software suite divided into three distinct products that share and build upon the same database. The three products, HyperSizer Material Manager, HyperSizer Basic, and HyperSizer Pro are available as a suite or can be used individually. One feature they all share, though, is that the software blends seamlessly with standard design software and uses a familiar Windows interface. The use of a Windows platform was one of the first risks the company took in developing HyperSizer. In the 1990s, when this product was first being developed, most design software was Unix-based and ran on very expensive workstations. Company founders made the early decision to write and code for the Windows platform, gambling correctly that the future was in the personal computing platform and widespread acceptance of Windows within the engineering community. Another gamble was investing in developing composite material technology early on, and that decision was similarly validated by the increasing acceptance of composite materials within the aerospace industry and the growing need for the NASA-derived software suite. The simplest of the three products, HyperSizer Material Manager, eases the design process by offering an easy-to-use materials database with interactive graphics depicting different metals, foams, honeycomb structures, ply tapes, and fabrics. The software allows users to create composite laminates from these various materials using standard Windows copy and paste functions. The software will then analyze the materials and structures using a variety of composite failure theories, as well as preliminary analysis for stiffness, thermal behavior, and structural strength. The software also creates graphs for display of variables with temperature dependencies, failure envelopes, and stress/strain profiles. HyperSizer Basic includes all of the features and capabilities of the Material Manager, but adds additional analysis for 50 different panel and beam concepts, as well as the ability to analyze other combinations of materials and structures. HyperSizer Pro includes all the features of HyperSizer Basic, but adds full vehicle design analysis. It works with FEA programs for system-level analysis and automatic finite element model resizing, and it generates stress report results for documenting complete vehicle structural design details. The software continues to mature, and its capabilities grow. When it was first developed at NASA, it was primarily employed for lightweight designs but was not considered a final design tool. It is now being used for final designs on larger projects. Companies are using HyperSizer to gain certification for flight readiness with the Federal Aviation Administration. Customers, including NASA, are placing a lot of trust in the answers it generates.